As the kids imitate pirates on a treasure hunt set up by the villa staff and the echo of their laughter creates a melody with the gentle hum of the tide, you’ll realize that in all your time at Villa BKP BKP in Virgin Gorda, you haven’t stopped smiling. Children of all ages can practice their gymnastic skills on the sea trampoline, cast a line on a fishing excursion, be a rock star on the karaoke machine, make friends with sea life during a snorkeling expedition, and act like world-class athletes during the Beach Olympics. These are just a few of the amenities and activities that will delight kids and kids at heart during a stay at the spectacular Villa BKP BKP. This six bedroom hideaway can comfortably accommodate every member of your party from infants to adults with facilities for up to 14. Teens can have their own space in the Games Pavilion furnished with either 2 twin-sized or 1 king-sized bed. The pavilion features a pool table, Play Station 2, iPod player and other comforts perfect for teens. For the little ones, BKP BKP’s private beach has a shallow tide pool where toddlers can build sandcastles, collect seashells, and watch little fish swim. The villa’s infinity pool also has a shallow end with stairs, and floaties are available for those just learning to swim. Cribs can be set up in parents’ rooms at no additional charge, and all members of your group will enjoy the privacy of this picturesque Caribbean retreat. Decorated in majestic jewel-toned silks and hard-wood, matched with the unique copper domed roofs, the pavilions of Villa BKP BKP are gorgeous inside and out. This large family villa also comes complete with a six-member staff including gourmet international chefs who are sure to delight even the pickiest palettes. Making meal time easy, Villa BKP BKP offers a kids menu with familiar favorites including Marvelous Mac N’ Cheese and Luxury Lasagna. After dinner, enjoy delicious homemade ice creams and sorbets that will leave you sighing with satisfaction. After a hard day at play, take some time to enjoy the Spa & Wellness Pavilion, your personal relaxation haven. Then lounge on the porch to view breathtaking sunsets. As the sky changes from orange and pink to a rich navy blue and the clear night sky sparkles with stars, take a look through the villa’s telescope. As you dream of distant galaxies, you will think to yourself there is no place you’d rather be than Villa BKP BKP. Isn’t it time you discover paradise? 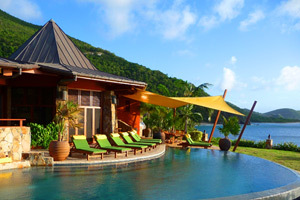 Start planning your Caribbean family vacation at Villa BKP BKP with WIMCO.